We had to get up early again this morning to get breakfast and get off the ship to meet up with our group for our excursion to the Coba Mayan ruins, over on the mainland. Our shoes were pretty much completely dry, our hats were totally dry, and our electronics were still functioning, so all was good. We checked out of the ship and headed down the pier to find our ferry. 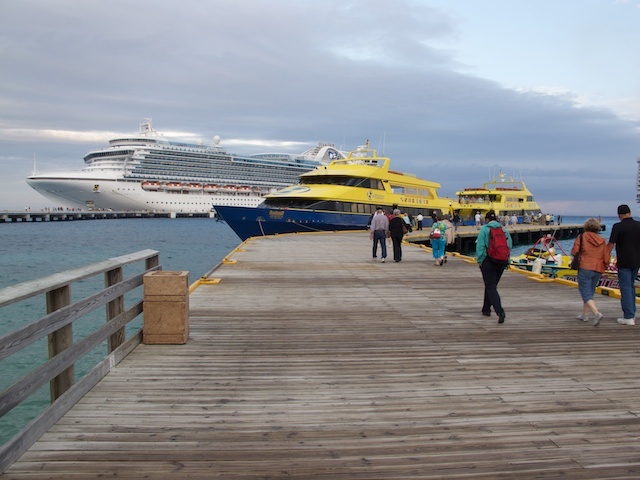 The first leg of the excursion was a high speed ferry from Cozumel to Playa del Carmen, about 45 minutes away. Heather didn’t do so well on the ferry thanks to the rough seas. She wasn’t exactly seasick, but had some motion issues due to the pitching and rolling. We’re going to try to sit on the lower level, closer to the center of the ferry on the trip back. Once we arrived, we went over to our tour bus and met Raul, our guide for the day. 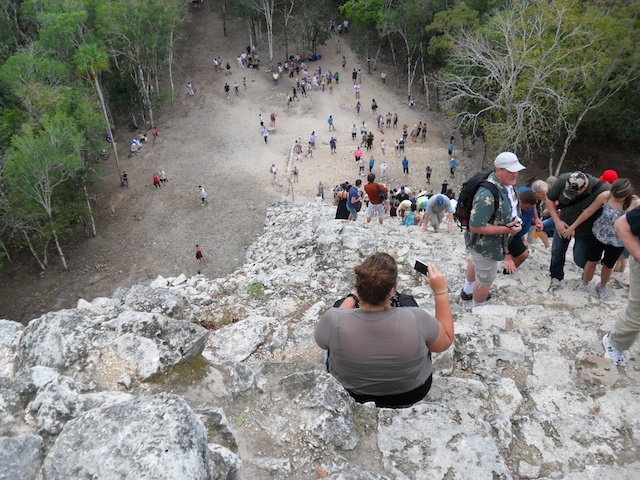 Once everyone was loaded up, we headed out down the highway for Coba. The first stop was about 30 minutes out, at a gift shop they’ve got a deal with, so that we could spend some money where they’d make a little more off of us. We nosed around and found a few things that we liked, so it wasn’t a wasted stop. Plus it was the last restroom break until we got on site. After that we got back on the bus and continued down the road to Coba. When we got to the site, it was more crowded with other buses and cars than I’d expected, and the range of languages spoken was fascinating. I heard French, German, Portuguese, and something Slavic sounding. Raul had our tickets, so we got to jump ahead of the large line and head in. The weather cooperated nicely today, with sun and the occasional cloud for a little shade, so the hike to the first structure was fun. We stopped at a small palace, got to climb up on it, and look around, while Raul gave us some more information on the site and Mayan life in general. From there we hiked to a smaller pyramid, one that climbing was prohibited, and learned some more about the layout of the city and the road were were about to see. Like the Romans, the Mayans built roads between their cities, though few of them remain intact. We got to walk over part of one there, and I managed to get some pictures of it in spite of the mob of French tourists blocking the shots. Sometimes it’s good to be the ugly American. 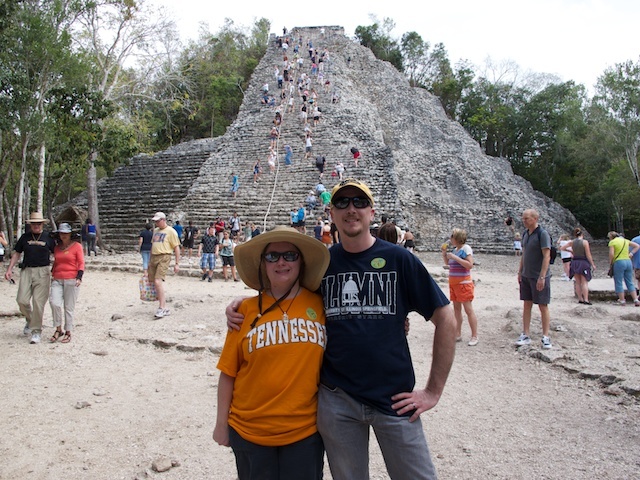 After that we hiked over to the high point of the tour, the Nohoch Mul pyramid. Since the weather was good, we had an opportunity to climb it. If you go, and you’re able, please do not pass this up. Climbing up was challenging, but not terribly hard. The sides are steep enough that it was easier to do a low crawl up, hands and feet on steps, and just head up. Upon reaching the top, I was more than a little freaked out due to my fear of falling. I had to force myself to not hug the walls and take in the view. You’re so far above the canopy that you can see for miles. There was one other temple sticking out of the forest below, but other than that it was a sea of green. Heather made it up as well, and we took some pictures of each other as well as asking a fellow climber to take one of the two of us. Then it was time to head down. I let Heather go first, and she did the whole thing standing up. I, on the other hand, did most of it sitting down, until I was far enough down that I was pretty sure I’d survive the fall. This was probably the coolest thing we did on the trip, and I’m glad I didn’t chicken out. From there we went over to one of the ball courts on the site and got to learn a little more about how the game was played. Our final stop, after that, was at another pyramid, which I think was the one we could see through the trees when we were on top of Nohoch Mul. This one was closed to climbing because it has gotten a little unstable, but we got some good pictures of it. After that, we hiked back out, and did a little shopping at the stores on site. I picked up a few things for Reese and Heather, after a suitable amount of haggling with the store owners. And then we got back on the bus for a boxed lunch and the drive back to Playa del Carmen. The sandwich was delicious, and we got the recipe for the spread they used on them. It turns out it was a lot more simple than we’d thought, being made with media crema, cilantro, and garlic. When we got to Playa del Carmen, our guides herded us back on to the ferries for the ride back to Cozumel, but not before we got a few pictures on the beach. It just seemed to be wrong to be at Playa del Carmen and not actually set foot on the playa. The ferry ride back was a lot better for Heather because we were able to get seats low and in the middle. She was actually able to look around instead of just keeping her head down. Once back in Cozumel, we did a little more shopping, picking up hot sauces and other gifts for friends, as well as looking for somewhere to mail a postcard to Reese. We totally struck out on that one, so it’ll be mailed once we get home. Finally, sadly, it was time to get back on the ship and enjoy the last formal dinner night. Dinner was great, as usual, and we took advantage of a few more of the ship’s photographers to get some good couples shots of us. We did not do any laps around the ship tonight, because we hiked around 5 km during our tour. Our bright point was that we were notified that we were on the ship’s tour, scheduled for tomorrow just after lunch. We’ve been looking forward to doing that all week, and it was nice to find out that it was going to happen. The Crown Princess and our Ferry from Cozumel to Playa del Carmen. 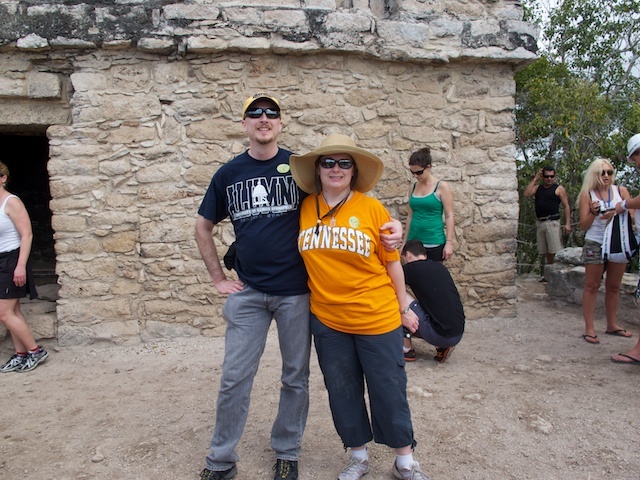 Us in front of the temple on top of Nohoch Mul. At the base of Nohoch Mul. 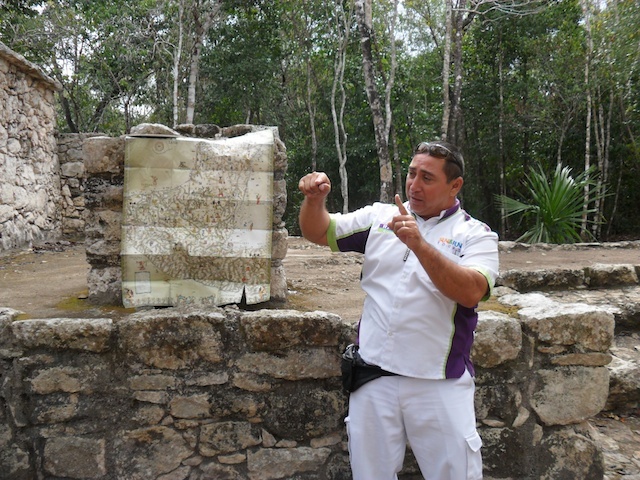 Raul, our guide on the Coba tour. 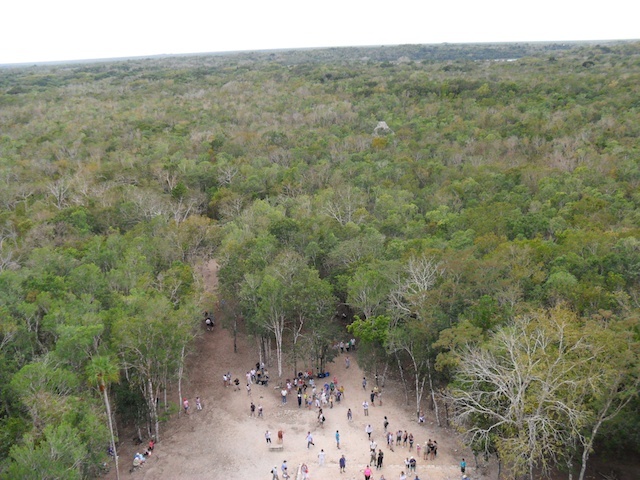 The view from the top of Nohoch Mul. On top of Nohoch Mul, looking down at what we climbed.